The funeral of veteran leader of women rights and leftist movement Hena Das was held with state honour at Narayanganj crematorium yesterday. Earlier, thousands of people from all walks of life paid their last respect to the leader of the poor at the Communist Party of Bangladesh (CPB) central office where her body was covered with party and national flags. CPB leaders and different left-leaning parties placed wreaths at the revolutionary leader's coffin. The body was then taken to the offices of Bangladesh Shikkhak Samity and Bangladesh Mahila Parishad and later to Central Shaheed Minar where she was given a guard of honour. Muktijoddha Central Command Council also provided a guard of honour to her. 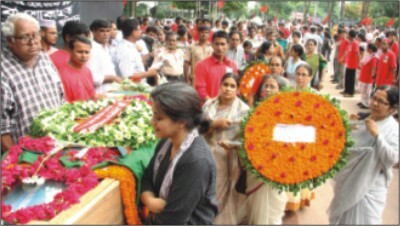 Education Minister Nurul Islam Nahid and State Minister for Science and ICT Yafes Osman placed wreaths at the coffin. Different political parties, including CPB, Workers' Party of Bangladesh led by Haider Akbar Khan Rono, Gono Forum led by Dr Kamal Hossain and Pankaj Bhattacharya, Jatiya Samajtantrik Dal led by lawmaker Hasanul Haque Inu, National Awami Party, Communist Kendra, Democratic Left Alliance, Trade Union Kendra, Khetmajur Samity, Jubo Union, Sammilita Sangskritik Jote, Chhatra Union, Udichi Shilpi Gosthi, Khelaghar Asar and Garment Sramik Trade Union Kendra also placed wreaths at the coffin of Hena Das. Later, the body was taken to Narayanganj Girls' High School, Narayanganj district CPB office and Narayanganj Shaheed Minar where cross section of people paid their rich tributes to the woman leader. Hena breathed her last at Bangabandhu Sheikh Mujib Medical University on July 20 with a number of old-age complications various at the age of 85.